Ware dedicated to continuing our support to World Vision. World Vision is a Christian relief, development and advocacy organisation dedicated to working with children, families and communities to overcome poverty and injustice. World Vision serves all people regardless of religion, race, ethnicity or gender. 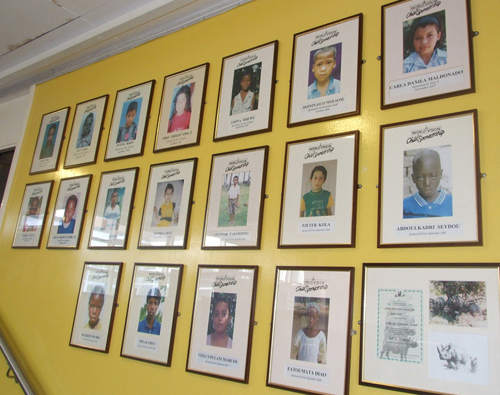 Over the years, Brownlow Integrated College has proudly sponsored twenty children from countries around the world, and currently we are sponsoring eleven children, as nine have left the World Vision scheme. The scheme began in Brownlow in 1996 by Year 8 pupils who cared for their individual child throughout their school career. Now each year group within the college is responsible for its own child. £20 per child, per month is paid directly to World Vision from Brownlow Integrated College. The money comes from both pupils and staff. Each Year Head collects the money on a weekly basis from form teachers who have World Vision tins in their room. This money is banked and used to ensure each child is cared for. Christmas cards and birthday cards are also sent to each child. Pupils and staff within the school are very generous in their donations. This is evident in the continued success of World Vision within the school. Many thanks to everyone (past and present) who has contributed to such a worthwhile cause.